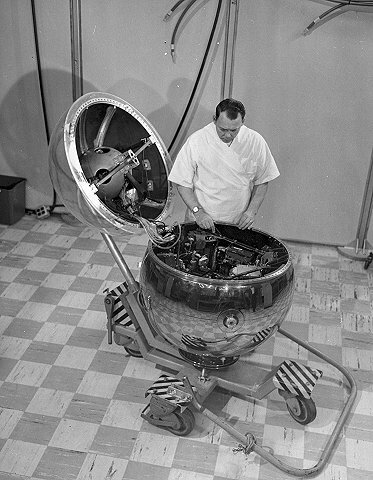 This satellite is Explorer-17, a.k.a Atmospheric Explorer-A or S-6.It weighed 185 kg. It was launched on a Delta rocket from Cape Canaveral on 3 April 1963. It entered an orbit at 57.6 degrees inclination and altitudes 255-917 km. The initial period was 96.4 minutes and decayed from orbit on 24 November 1966. I must admit that I have doctored the picture a little to make things more difficult. I removed the badge on the technician's suit.